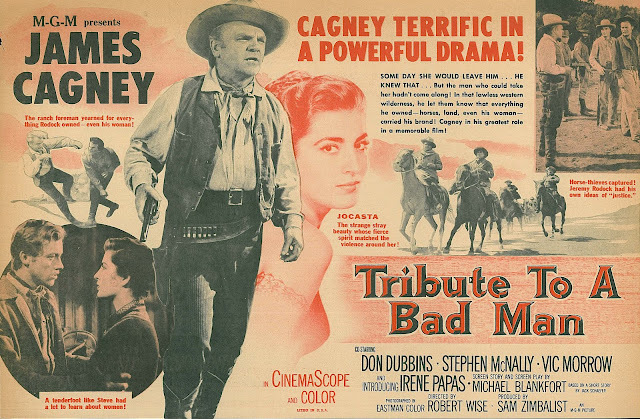 Herewith is MGM's version of the Tribute To A Bad Man breakdown as dutifully reported in June-August 1955 by The New York Times: Work was proceeding on Colorado mountain locations under the direction of Robert Wise. 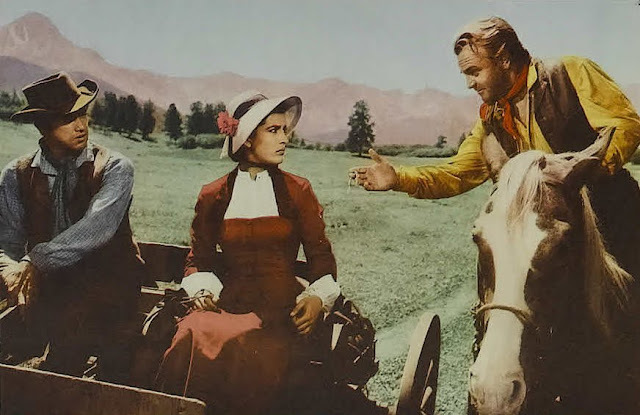 Mr. Tracy had experienced difficulties working in the high altitude, said the studio’s publicity department. Gossip suggested otherwise, however. Metro acknowledged as much by admitting there were other causes for Tracy’s summary departure off the location. Spencer is very exacting about everything he does, remarked one executive, and he is unhappy about several things. The studio has to determine if it wants to give in to him on some points. Meetings with the actor’s agents convened as the crew of 110 sat idle. 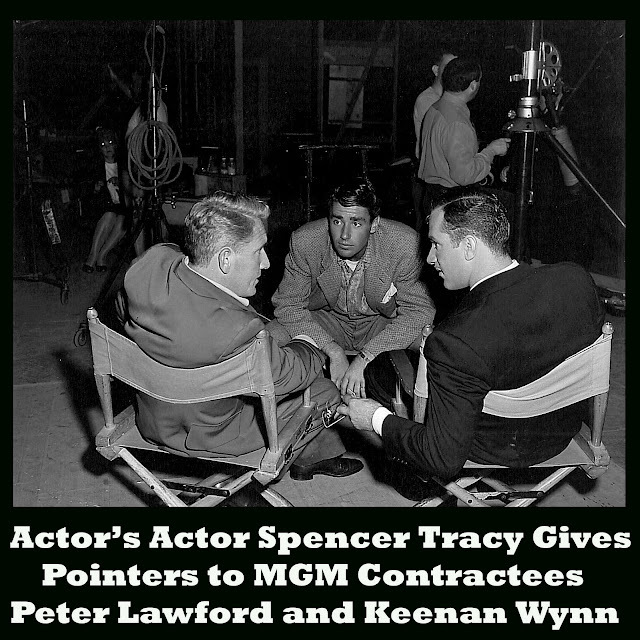 Two days later (June 23) it was reported that Metro-Goldwyn-Mayer is resigned to replacing Spencer Tracy in "Tribute To A Bad Man," due to Tracy’s being not physically up to the assignment. By June 30, Gregory Peck had turned down replacing him, as would several others. 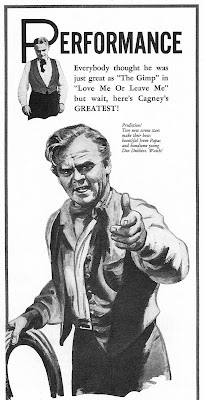 James Cagney was then announced as being under consideration. 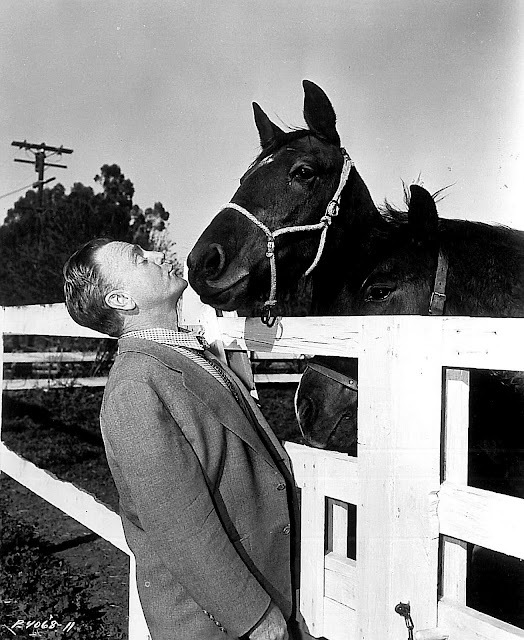 By August 4, Cagney was confirmed for the lead and set to begin work by mid-month. This was the official version of events as conveyed by MGM. What had actually taken place was longer in surfacing. Late in life interviews with Robert Wise and Cagney filled in details even James Merrick omitted. The saga of Tribute To A Bad Man, all told, offers considerable insight into ways of doing Hollywood business very soon to end. Stars often acted out once they sized up projects for dogs. Spencer Tracy had recently done Broken Lance for Fox and saw Tribute To A Bad Man as more of the same. Even its title was shopworn, having been intended for what became The Bad and The Beautiful in 1952. Grace Kelly was proposed as co-star for Tracy. There was indication of his having a little crush on her and willingness maybe to do even a bad picture so long as she came with it. That scuttled fast once Kelly saw the script. Tracy’s support was largely culled from newcomer ranks. That would make his a higher hill to climb, a fit analogy, as these Rocky Mountain settings were eight to ten thousand feet in altitude. Among Hollywood’s bigger challenges was development of young talent to succeed veterans like Tracy. Universal prospered at star manufacture. Others less so. Metro would borrow Columbia’s Robert Francis, late of The Caine Mutiny, to work alongside Tracy. An untried Greek actress, Irene Papas, was tabbed for the Grace Kelly part. Tracy claimed to be early bound for the Colorado location, but didn’t show up. Weeks later, he flew in, socialized with the crew, then disappeared for parts unknown. Wise finished everyone else’s scenes as overhead soared (cost to Metro: $30,000 per day). Producer Sam Zimbalist panicked as search parties found no trace of Tracy. When he finally surfaced after two weeks, ST bitched over the script and said he couldn’t breathe thin mountain air. Robert Wise recalled his star’s outlandish suggestion that the entire ranch complex built for the film be relocated to lower elevations. Metro trouble-shooter Howard Strickling arrived to try and reason Tracy back to work. Hours were spent negotiating in trailers. Wise was sick of having authority usurped by his leading man (seems ST was determining which of his shots were keepers). MGM tried covering with bogus accounts of Tracy attending local functions amidst work’s smooth continuance. Finally, Wise had enough and said he wanted Tracy gone. 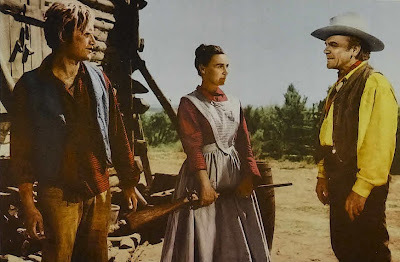 This was a standoff the actor would have won ten years before, but 1955 being a new day, it was Spence what got the hook. Doubtlessly stunned by said new rules in play, he broke down utterly to a stunned Robert Wise: That’s the end. My career is finished. I’ll never work again. The first call for replacement went to Clark Gable, now a free agent and much in demand. To wrangle a major name on mere weeks' notice wouldn’t be easy, and besides that, Gable still nursed enmity over ways Metro had done him wrong. Tribute’s several months break was further complicated by the death of Robert Francis in a plane crash (7-31-55) during that interim. He’d be replaced with Don Dubbins, a neophyte to film whose prior work was juvenile lead in the road-company of Tea and Sympathy. Spencer Tracy was meanwhile let out of Metro via settlement of his contract, said parting announced as an amicable one with ST in receipt of a pension for two decades service to the firm. 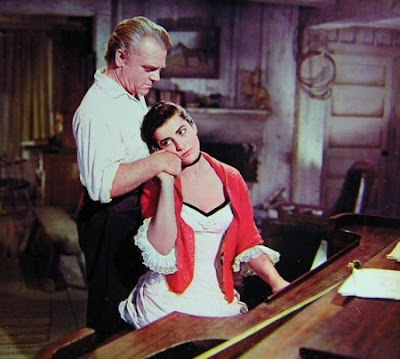 James Cagney said years later that he did Tribute To A Bad Man mostly as a favor to Tracy, one of his closest filmland friends. Jim was fifty-six going in, having developed a paunch that was there to stay, but game withal for stunts not limited to an acrobatic fistfight with Stephen McNally reminiscent of fleet-footed Cagneys of yore. Sensitive Don Dubbins was so much so as to be frankly a bore, especially in circumstances where you’d lots rather him take up arms to liven things up. This was product of postwar trends toward softened males inclined to (endlessly) hand-wring conflicts rather than strapping on irons the way Cagney’s crowd would have in livelier times. Only bad boys (like Vic Morrow here) got much fun out of mislabeled "action" parts for youth. 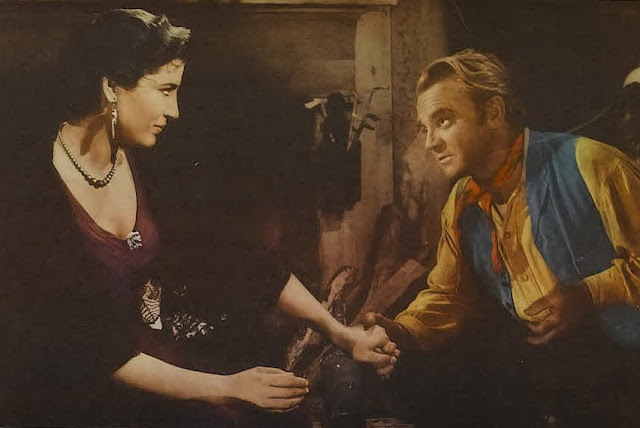 Tribute To A Bad Man dawdles among interiors hashing a Code-denuded romance between Cagney and twenty-five years his junior Irene Papas, side-stepping the essential question of whether or not she’s his mistress. Vets like JC treaded much 50's water playing (and replaying) lions in winter. Cagney especially tended to roar beyond capacity of jangled patron ears, ramping up decibels as if to compensate for age slowing him down. There was an interesting trailer wherein he extolled virtues of young Tribute players, putting up front Metro’s anxiety to mold a next generation now that his own was waning. Jim opens the preview seated on a tractor at his own working farm, reassurance that there’s life in the old boy yet (and above are 1955 publicity stills of Cagney tending agrarian matters). JC's passing a torch to dubious successors he garlands with praise, though Dubbins and Papas sputtering at the gate would frustrate those hopes. They’d continue to work, but never at lofty heights achieved by Cagney in his youth. Dressed out as it was in Cinemascope and color, Tribute To A Bad Man seemed poised to gross along lines of adult westerns then fashionable, but $2.8 million spent, much of that attributable to false starts with Tracy, Robert Francis, and others whose footage was scrapped, wilted in the face of only $1.2 million in domestic rentals plus $1.4 foreign. The final loss of $1.3 million landed Tribute To A Bad Man on a scrap heap piled high with MGM losers of that year, including Forever, Darling, Meet Me In Las Vegas, Gaby, and The Swan. Television’s merciless assault upon theatres was really being felt in the mid-fifties. Tribute To A Bad Man is recently out from Warner’s Archive. It’s a gorgeous wide transfer, certainly my first time seeing it decently presented. 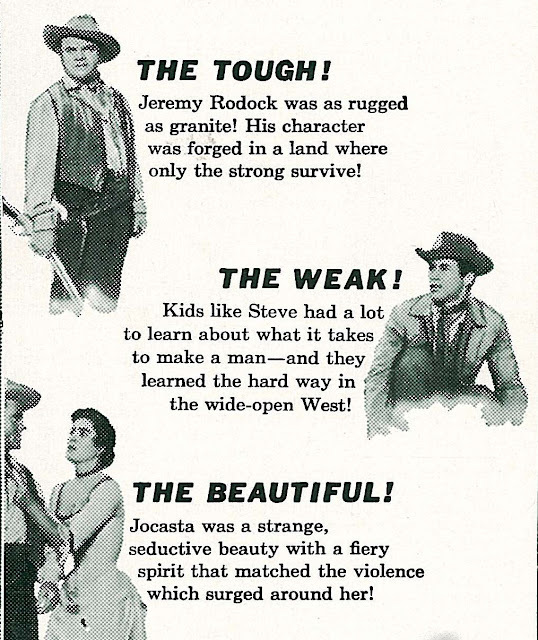 These lesser 50’s westerns play so much more effectively given advantage originally had in stereo-equipped theatres with scope capacity. Its DVD release may (should) occasion reevaluation for Tribute To A Bad Man as well as others so long ignored. "Publicists also separated from weekly checks peddled tell-alls about experiences they’d had behind company barricades." True enough, but one publicist who seems not to have spilled a single bean is Howard Strickling. Boy oh boy, how I wish I had the time, resources and ingenuity to look into what that guy did and knew; he must have left some kind of trail, no matter how well he covered it. The secrets he took to his grave would fill more than one book, I'll bet. 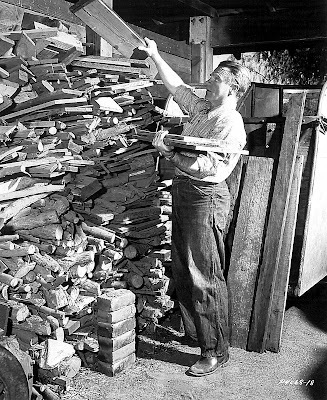 Jim, someone told me once that Strickling brought a barrel into his back yard not long before his death and burned all his files, insuring that nothing would later be published.